Daddy - can't get enough of Him. She is a Daddy's Girl for sure. the dishwaher - She comes crawl-running whenever she hears it opening. She stands against it and tries to pull the dishes out. I cannot keep her away from it. bathing - now that she's mobile the experience is all new to her. She likes to stand and move around in her little plastic tub. I plan to take her for swimming lessons before the summer is over. I think she would really enjoy it. dancing - Ms. V has picked up a shoulder shimmy somewhere. I don't know where but I love it. It's so cute. She loves it when I copy her moves. commercials - Apparently Mickey Mouse requires to much focus. She stops in her tracks whenever the American Cancer Society Happy Birthday and the U-verse commercials come on. 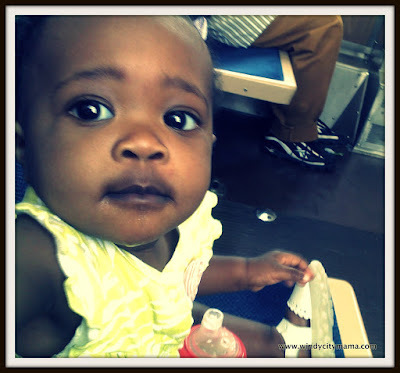 Sitting in her own seat on the train (briefly). Still all over the place. She's really good at going to sleep at her bedtime. The summer brings lots of events that have her up past her bedtime (7pm) but we never have an issue. I attribute that to sticking with the routine. Bath, bottle, and bed. I also think the Ferber book was helpful getting her to this point. That is why I'm revisiting the book. I pretty much stopped reading after the "getting baby to sleep on their own" part. I feel strongly there's a connection to the breastfeeding and her night waking. I've tried to wean her off at night but it's just easier to feed her. However, I feel like I haven't slept in months. The day He left for a business trip in February. I remember it well. I feed her 3 meals a day plus snacks. She loves puffs and mum-mums. Food can be iffy. Peas, sweet potatoes, and carrots are a thumbs up. She eats about a quarter of a cup per meal on a good day. We've started feeding her more of our food and she seems to enjoy it more than her purees. I think it's a delicacy for her. French fries are her absolute favorite sadly we can't feed them to her all day everyday. She's still breastfeeding. Again, I hope weaning is around the corner. I'm so over it. Mainly, because of the night feedings. She has one tooth out! It's is a sharp sharky little thing. She has clamped down on the nips and it is not a good feeling at all. She can now hold her sippy cup well enough to get the liquid in her mouth. That just happened a few days ago. She tilted her head the right way and BAM..new skill mastered! Dada, Daddy, Ma-ma (occasionally), thank you (she mimics me when i pry lint from her hand and say it to her), gibber jabber baby talk, and she's still growling and grunting. If she wants more, she grunts. If she wants to be picked up, she grunts. Oye. Two more months to toddlerhood. What's it like having a toddler? Are there any drastic changes that you noticed? Having a toddler is like having a mini adult. They go through a stage of independence where they don't want you to help with anything. Moo certainly started talking a whole lot more. And here we are a year and six months later and she still hasn't ran out of things to say. LOL. I learned that toddlerhood is the time to start practicing healthy eating habits. I exposed Moo to just about every veggie known even the ones I don't eat. And because of it there aren't many she won't eat. We don't have to fight with her to eat healthy. Overall toddlerhood is when you really need to keep the camera handy. You'll be capturing first steps, dancing, first sentence and so much more. Awwww, I love this update. Despite the night wakes, it seems like V is doing really well. From what I've observed from other mama friends as well as my own experience, it seems like the breastfed babies take longer to sleep through the night. Guess it's the pros and cons of breastfeeding (good for the baby re. food, bad for everyone re. sleep). Hopefully, you'll be able to easily wean her ... and then you'll be thankful you were able to BF as long as you did. Gavin loves eating his baby food (we mix it with formula and cereal for texture and nutrition), but we haven't yet started feeding him table food. I think it's time. YAY this is so cool. And tell that girl leave the lint alone!! @YUMMommy does this mean she'll remove her claws from the back of legs? We're still struggling with the food. A couple of bites and she's over it. I hope I can get those first steps filmed. I'm excited for her. @Nilsa I've been trying to night wean but it isn't going so well. She wants her milk! @Tiffany if it weren't for lint, what would she eat?